Philae's landing points on Comet 67P/Churyumov-Gerasimenko on Nov. 12, 2014. The structure, composition and evolutionary history of comets are starting to come into focus, thanks to observations beamed home by the first probe ever to land on one of these icy objects. On Nov. 12, 2014, the European Space Agency's Philae lander detached from its Rosetta mother ship, which had arrived in orbit around Comet 67P/Churyumov-Gerasimenko three months earlier, and spiraled down toward the icy wanderer's surface. Two trajectory reconstructions of the Philae lander's touchdown on Comet 67P on Nov. 12, 2014. These initial observations — the highlights of which are reported in a raft of seven papers published online today (July 30) in the journal Science — reveal that Comet 67P is a porous body with a fairly homogeneous interior, researchers said. It also has a diverse surface that harbors many different carbon-containing organic molecules, the scientists said. "What really blows my mind is to have this combination of complementary results, allowing us at the same time to 'feel' the surface of the comet, very locally, as if we were there, while also getting the bigger picture through the sounding of the cometary interior structure," Nicolas Altobelli, acting Rosetta project scientist, told Space.com via email. "The implications of these measurements, and in particular the fairly homogeneous, very porous structure of the interior, will help constrain the formation models of planetesimals in the solar nebula, by a better understanding of the accretion processes," Altobelli added, referring to how planetary building blocks came together in the solar system's early days. 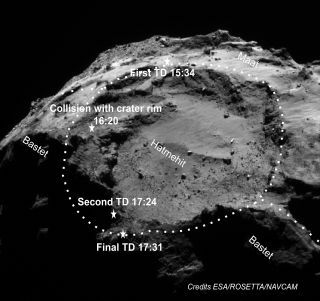 While Philae's double-bounce touchdown doubtless frayed some nerves among the lander team, it actually has provided some scientific benefits. For example, researchers were able to characterize 67P's surface at both the initial and final touchdown sites (which have been dubbed Agilkia and Abydos, respectively). And those two sites are quite different, it turns out. Agilkia's surface is relatively soft, covered with a layer of granular material about 0.82 feet (0.25 meters) deep, while Abydos is much harder. Images captured by Philae's Comet Infrared and Visible Analyser camera, or CIVA, highlight the diversity and complexity of 67P's surface, showing fractured, boulder-studded terrain with a variety of grain sizes and reflectivities. The soft "dirt" on Comet 67P's surface is up to 6.5 feet (2 m) deep in some places and nonexistent in others, photos taken by Philae's ROLIS (Rosetta Lander Imaging System) camera during the probe's descent suggest. ROLIS' pictures also reveal a boulder about 16.5 feet (5 m) wide, which is partly surrounded by a depression resembling a "wind tail," an erosional feature seen on Earth and Mars. Diagram of the washing-machine-size Philae lander. Mission scientists found a total of 17 wind-tail-like structures on the 2.5-mile-wide (4 kilometers) comet, with lengths ranging from 16.5 feet to 100 feet (5 to 30 m). These features appear to be caused by particles hitting 67P and abrading its surface, researchers said. Additional measurements from Philae's Multi Purpose Sensors for Surface and Subsurface Science instrument, or MUPUS, revealed that daytime temperatures on the comet's surface in November 2014 ranged from minus 226 degrees Fahrenheit to minus 298 degrees Fahrenheit (minus 143 to minus 183 degrees Celsius). Those temperatures are certainly higher now, however, because 67P is much closer to the sun. When Philae made the measurements, the comet was about 3 astronomical units (AU) from Earth's star. (One AU is the distance from Earth to the sun, about 93 million miles, or 150 million km). The comet, which circles the sun every 6.4 years, will reach its closest solar approach, of about 1.24 AU, on Aug. 13. Both instruments detected lots of interesting molecules. COSAC, for example, found 16 different organics, including four (methyl isocyanate, acetone, propionaldehyde, and acetamide) that had never been spotted on or around a comet before. "If such cometary material falls onto a planet in the right environment, emerging life could make use of it," COSAC principal investigator Fred Goesmann, of the Max Planck Institute for Solar System Research in Germany, told Space.com via email. Ptolemy's observations also revealed a rich mix of organics, along with lots of water and carbon dioxide. Philae's observations aren't just skin-deep. Using its Comet Nucleus Sounding Experiment by Radiowave Transmission (CONSERT) instrument, the lander also sounded out the comet's interior. This instrument picks up long-wavelength signals beamed through 67P by the orbiting Rosetta mothership. CONSERT data suggest that the "head" of the rubber-duck-shaped cometis internally homogeneous on the scale of a few tens of meters, and extremely porous, with open space making up 75 to 85 percent of its volume, researchers said. Image of Comet 67P acquired by the ROLIS instrument on the Philae lander during descent on Nov. 12, 2014, from a distance of approximately 3 kilometers from the surface. The image has a resolution of about 3 meters per pixel. Overall, team members said, Philae's measurements and photos are reshaping researchers' understanding of comets and helping pave the way for future missions to these icy leftovers from the solar system's early days. "Philae provided us unique information on a comet's surface properties (and interior) that could not be obtained from orbiter measurements alone," Ulamec said. "We learned so much about comets that now future missions can be adapted in a much better way to this challenging environment." "We keep listening and sending commands to Philae, every time we have an opportunity for communication," Altobelli said. Still, he said, the mission team is also quite busy with the Rosetta orbiter, which is now studying how 67P changes as it approaches the sun, one of the major goals of the overall Rosetta mission. If Philae does spring back into action around closest solar approach — also known as perihelion — the lander's double-bounce touchdown will likely be viewed as a blessing in disguise. If Philae had stuck its landing, "it would probably have lasted until about March, at which point the spacecraft would've gotten too hot and basically died," Wright said. "So the fact that we're going all the way up to perihelion is something that we could never have planned to do. But it does remain to be seen whether we can get this [communication] link back."